5 YEAR FULL WARRANTY ON OUR LG-QUAD FOUR IN ONE COMBO! 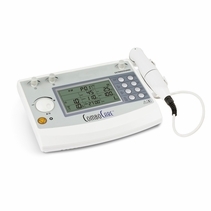 FOUR PROVEN ELECTROTHERAPY CLINICAL MODALITIES in ONE PORTABLE DEVICE! 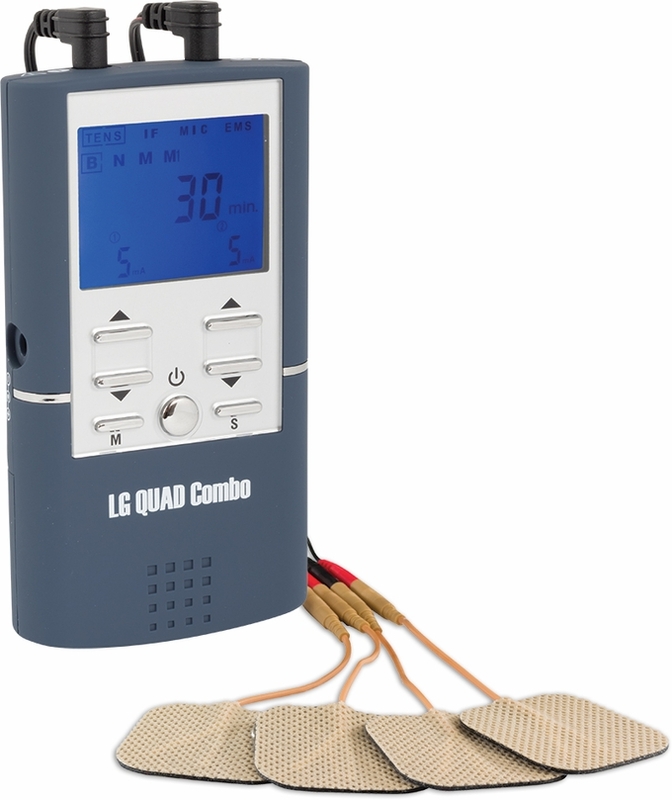 Our LG-QUAD COMBO is a clinical TENS Unit, Muscle Stimulator, Interferential Unit, and Microcurrent Unit in one portable device. Use the LG-QUAD COMBO on the road with the included batteries or plug your unit in at home or office with the convenient included AC Adapter. 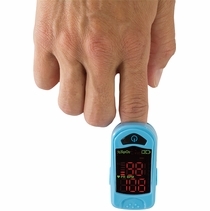 This device is light and small, measuring just 4.5 in x 2.5 and is 1 inch wide. The LG-QUAD COMBO has a built-in belt clip for "no hands" usage. Easily choose one of the four treatment modalities and choose your program, settings, and intensity. The LG-QUAD COMBO portable unit comes with everything you will need for immediate use. It has the same intensity as the units in the office, so you will achieve great results. The LG-QUAD Combo comes with a Quick Start Guide and Manual (in English), Lead Wires, Battery, AC Adapter and Carrying Case. If you have any questions you can call our trained representatives Monday to Friday at (888) 633-7360 and we will be happy to assist you. 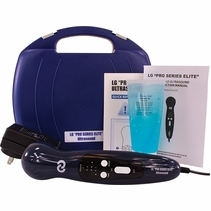 Simply place the electrode pads on your treatment area, and turn on the unit. 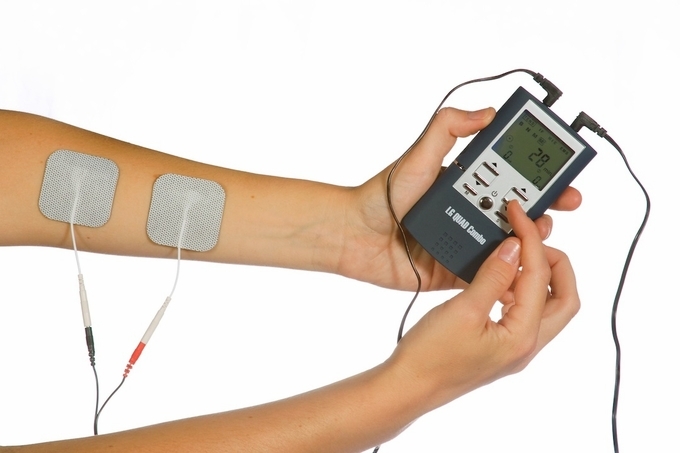 Select one of the 4 therapies that you would like to use - TENS, Muscle Stimulator, Interferential, or Micro-current Unit. Adjust the Pulse Width, Pulse Rate, and Intensity to you're comfort level. Experiment or use a free electrode chart to find the best placement for you. With four different therapies in one, you are certain to find the most effective treatment(s). More Info on the LG-QUADCOMBO full range of treatments. 1. 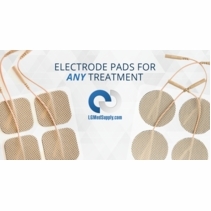 Extra Electrode Pads LGMedSupply manufactures high quality, premium electrodes. The LG-QUAD comes with 4 Electrode Pads that last approximately 20 times. We also recommend purchasing some additional electrodes with your order. 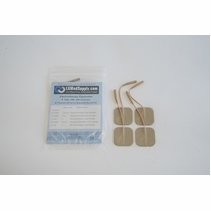 At some point you will need to replace your electrodes, and it is good to get a couple extra packs of our Premium Electrode Pads that we offer with your unit. Check out our Additional Pain Relief units, such as our Portable Home Ultrasound Unit. 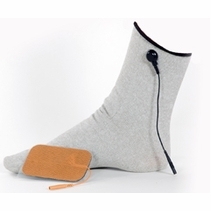 Ultrasound Units help speed the healing process by reducing inflammation and swelling. An ultrasound unit is also a good modality to add to your aresenal. good unit 5 This is a very nice unit. I bought it for my mother. Both of her therapist have used it on her and they both want to buy one for themselves. It is better than the one their company has. Unfortunately one of them dropped it and the screen fades in the bottom left corner. 5 I just got my LG QUAD Combo and gave it a run through and I'm quite happy with it! Haven't had a TENS unit since 1998 and with this latest bought of back problems and going to PT which is only carrying me for a few days at a time I thought it was time I got another one!!! 5 Had a nasty motocross accident and broke ribs, my back at the L4-L5 and also shattered my pelvis. Lets just say I was a total WRECK. After 8 months of rehab and my office visits were all used up that insurance would pay for I needed something to help me along the way to recovery. This device has everything I was getting at PT and best part is that I don't have to leave home to get treatments! I am 34 years old and still in pretty good shape but I really need this unit at times to help manage my pain levels. Really like that I can take it with me using a battery or if I am at home I can just plug it into the outlet. 5 I am a Retired RN and have previously rented a TENS Unit, years ago, after a back injury and bone fractures, and it worked wonderfully. My Hubby bought me the LG-Quad Combo and I have been using it for two days now, for my constant bilateral wrist pain and thumb pain from Rheumatoid Arthritis and as needed for occasional back pain flare ups after working in the yard/garden etc. I LOVE the product already. I did have to use a magnifier to read the instruction booklet over 50 eyes but it didn't take long to start using the device. I mainly use the TENS setting and prefer Burst to use on my wrists and thumbs and can use it while I am on the computer or working around the house. My bil. wrist pain is so severe that it makes me cry and I am usually up most nights with the pain trying to relieve it with hot tub soaks, OTC meds, Vitamins & Minerals, and some mild RXs even during hot summers in the South. My Doctors have been unable to control the pain or determine it's origin other than the family history of RA etc. Had to have something to relieve this pain so that I could work professionally and be able to pass drug test as I refuse to be on pain RXs as so many people/patients are these days. This product has worked well for me the past two days and I am sure I will be using it from now on. I will have to purchase Rechargeable 9 V batteries for car trips etc. I would recommend this product to anyone that has chronic and acute pain that doesn't want to go the pain med route. I have seen wonderful results from TENS Unit devices in the past as a Medical Professional and so far I am SOLD on this product. Thank you LG Medical Supply for pain relief. 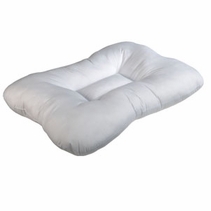 5 Best investment I could have made to manage chronic lower back pain. It does have a lot of options but I mainly use it on the TENS and EMS. It is great I can vary the parameters as needed. I had another cheaper unit which I used for years but it did not have the programmable options like the LGQuad Combo has. Also, this unit I think is much better than the ones being sold at the Malls. Oh yes, I got 9V 600mA rechargeable batteries on Amazon and they work for days as I use my many times during the day. Regular 9v batteries don't last long. You might want to order an set of extra connector wires because they can be easily damaged. My co-workers have asked me for the website. 5 Love my unit. Doctor suggested I use an IFC unit after my back surgery because I don't want to take meds and this thing works like a dream. Like someone else said the directions are a little lacking that come with it but there is some info on this website somewhere with so diagrams on where to place the pads and settings and stuff. Anyways it really helps alleviate the pain in my lower back/spine. Meds are no longer necessary and for that I am grateful to LG and this product. 5 I purchased this unit after having a knee replacement. I decided to go with the unit that had EVERYTHING the price of the unit was the price of two trips to the doctor, it pays for itself. I had a little difficulty programming the unit, but called and spoke to tech support and they walked me through it. Very simple, once you know what you are doing. Thank you LG! 5 I'm absolutely IN LOVE with this Quad Combo Unit! I've been looking at ordering a TENS unit for months, went back & forth looking at different places such as Amazon and after finding this website, decided I wanted an LG opposed to other cheaper brands. Then, I couldn't decide which model to get! I am SOO happy I talked myself into one that had different modes -- Thought I would prefer the TENS mode, but I actually like the Interferential mode the best! If you're on the fence about ordering one... GO FOR IT! Shipping was FREE & SUPER FAST!!! It is necessary to read the instructions, but it wasn't hard to figure out. I really cannot say enough good things about this Unit. I suffer from terrible chronic back pain & have been considering surgery. This has absolutely been the best thing I've found in the year I've been suffering from debilitating pain!!! 5 I can say WOW! 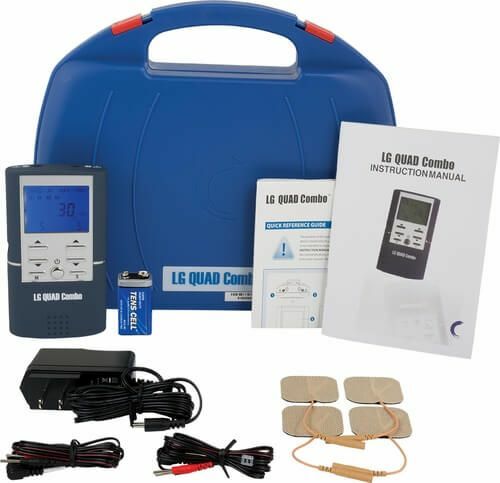 I did purchase the 4 in 1 LG 'Super' QUAD COMBO TENS Unit. After using it a couple days, I can say that it is in every way equal to the EMS unit used on me at my Physical Therapist's office. Even though I'm an RN and used to learning how to use many electronic equipment, items, there is a steep learning curve with this and probably all Quad unit. However, you can save a lot of time if you don't get too excited and just closely follow the quick instruction sheet and cycle through the settings for your preferred mode, then it is easy to learn to use. I had a bit of trouble the first couple uses. But after I started following the instruction Guide Sheet closely and step by step, I was good to go. A day later, it's easy. I have multiple areas with chronic pain issues, much of which is likely due to my computer job and posture. Normally, I wake up with horrible neck, shoulder and low back pain. 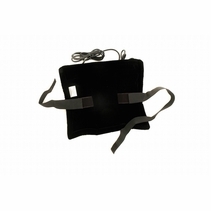 However, Last night I used the EMS for my lower back, neck and shoulder trapezius muscles. I was slow and clumsy at first, but after I figured out how to handle and apply the very "sticky" pads that latched onto anything coming close, I was good to go. I went to bed for the first time last night without any pain in these areas. Then when I woke up this morning it felt heavenly to not wake up with a stiff neck and back. I just don't see why Medicare has stopped covering TENS units, saying they are inneffective-That's just SO wrong!. I'm SOLD on it. The biggest medical problem I'm dealing with is the loss of muscle due to taking Statin and Fenofibrate cholesterol lowering drugs. Despite my telling my MD about the horrible pain I was experiencing for nearly two years, she continued to insist I take the drugs. I did. One day I said "ENOUGH" Before I took those drugs, that I later found out are called "Aging drugs" because in my research about these drugs, so many people lost much of their muscle mass while taking them. Before I took them, I was healthy and well muscled. Almost 2 years later, I'd lost about 80% of my muscle and had gotten very weak and in constant pain... Going to the Physical Therapist 3x a week has helped to get me back on the road to health, but there is no way I can afford to spend .00 or more a month in co-pays. The only thing the PT did that I couldn't do was TENS and EMS here at home. Now I can. 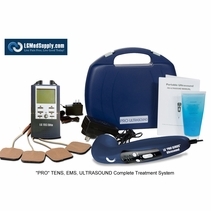 So after much research on quality TENS/EMS units, I found and turned to LG Medical Supply. I found this particular unit with their excellent help. It is truly a medical grade unit and the price is well affordable. It works very well on the different modes. My use is mainly for EMS to help strengthen certain muscles that were badly damaged, of course I'm also doing a regular Exercise Program and good diet I am already well on my way toward regaining the muscle and strength I had so sadly lost. Mainly in thighs, lower back, upper back, rt calf, neck and shoulders. LOL! All over I guess. This LG Quad is an excellent unit. I highly recommend it. It is a huge part of my rehabilitation program. Customer service is also quite good, and quickly answered in good detail my many email questions. Thank you Wes, for your patience. I look forward to doing future business with this company. 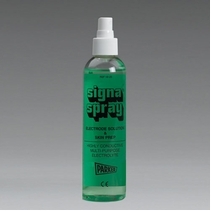 Lastly, the Spray for Electrode sticky pads, It is an absolute necessity to buy and to use this spray. And DO follow closely the instructions they give on how to use the spray to keep the pads fresh and sticky. It does what LGMS says it does. I also use it to clean the skin before applying the pads. It really works. I find the Spray to work very well. If you spray lightly on the area of the skin like they recommend, the pad goes on and stays put. Simply put, the spray WORKS, it does make the pad stick really good. I use the spray directly on the pads after I'm done using them. By the next use, they are all plumped back up and as moist and sticky as when they were new. I do believe the spray will make the pads last through many uses and remain good and sticky. I live in average 7% humidity in Arizona. The spray is mandatory for me to have and use. IF I could rate this company and this unit higher than 5 Stars, I would give it a 10 star rating. THANK YOU LG Medical Supply! 5 This is a great product. Well worth the investment. I have herniated disc in my lumbar spine and cervical spine with radiculopathy. The unit definitely alleviates the pain without the need of medication. I particularly find the interferential unit exteremely helpful. However, my husband recently had acute back pain and his sypmtoms resolved over a period of 2-3 days as he consistently used the TENS alternating with EMS. I would recommend discussing with your physician before purchase. 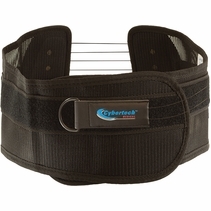 5 I've only used this for two days, but aside from some confusing directions in the manual, its working great on my lower back and contrary to package warnings I'm using it to treat nerve pain on my lower jaw and it works very well at a low intensity setting. Once you use it a few times, its easy. Worth the money and a phone call to LG answered my questions re: programming. 5 I bought one of these units a couple months ago and am very satisfied with it. I was a little concerned when I bought it that it might not have enough power as it is a lot smaller than the unit at my chiropractor. Not a problem. I have not been able to get this near maximum and on a couple occasions actually induced a muscle spasm by accident when I set it too high. The one problem I have found is that it uses up batteries very fast. I didn't get the rechargable option which may address this. The second is a caution on the IF setting. Since this setting has a frequency that runs up and down, if you bring up the intensity quickly to a comfortable setting, it will go up much higher once you stop hitting the button. Best to bring up slowly in this mode. Other than that, great unit. 5 I bought this to replace a unut my doctor gave me that my insurance would not cover the cost. I also purchased the Ultrasound Unit and I am no longer a skeptic about the benefits of using it. These units are better built and ease of use than the one given to me by my doctor. I have Psoriatic Arthitis and Psoraisis, many forms of it. My disease has left me in pain each day most days reaching pain levels of 10 if I do not use my units. I definately recommend the company as well as their products to people looking for alternative pain therapies or are in need of more relief as I was. Don't be a skeptic or think I am receiving the best there is to offer as I did for too many years. We can have relief, daily relief, lasting relief. I must be honest here though, I am still on my regimene of pain meds but having this to use is the best. Find your relief and then go live llife better; don't settle, these are one of the best products I have ever found! 5 Emily loves this product, she use it on my knee after surgery, She use the product at least two times a day. Whether it is on my knee or hamstrings it relieves the pain. My therapist loves the stimulator also. It has everything on it and more. They wish they could have several stimulators so they could use them on their patients. No matter where you use it, it will help and is well worth the money. 5 Got the Quad Combo Tens unit after my Physical Therapy Doctor Recommended it to me. I have chronic Shoulder Pain and Low Back Pain from numerous motocross crashes. Fractured T-11 to T-9 Vertebrae and Had complete shoulder reconstruction when I was only 17. Anyways the Interferential Unit setting is very helpful for me, and the other features work well, the EMS Muscle Stimulator is nice to use after working out. Thanks LG this product is awesome. P.S. I ordered this product on the 2/21/12 and is shipped out on the 22nd and was at my door on the 24th and I live in Hawaii. I will recommend this product to everyone!